A host based JSON/XML API for interacting with the AIM service. Very Web Twopointoh, and therefore 2.0pen. Hard to use or get up to speed with. Use one of the "Whimsicles" to embed functionality in your page. We'll use the Buddy List widget as an example. Add a reference to aimapi.js to the head of your document. Add an element with an id of "AIMBuddyListContainer" with an attribute named "wim_key" with your developer key as its value. Add an anchor element with an onclick handler that fires "AIM.widgets.buddylist.launch();". Great, I have a Buddy List. Now what? AIM ids are also class names. Every aspect of the list is customizable. Add additional icons to the buddy list. Only show buddies that share similar interests. ...or whatever else you can think of. After all, this is just HTML and easily accessible via the DOM. As such, it is infinately hackable and mashup-able. You could check if a person in the buddy list has a public gallery on pictures.aol.com, and if so - add a link next to their name to that gallery. What if a popular online shop stored your AIM id with your information, and the service provided a "wishlist" feature? That shop could add links to the buddy list that go off to that user's wishlist, or only display buddies with wishlists in a side menu. 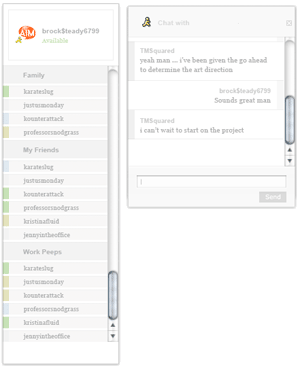 Extended IM capability - for example, a Picto-Chat like interface. How it works - a WIM Walkthrough. What follows is a step by step examination of what happens from the time a user clicks "Launch my Buddy List" until they see their list render. Does generic checks and environment setup. Does the AIMBuddyListContainer exist in the DOM? Do we have an API key? All transactions occur over HTTP using dynamically created script elements via the AIM.core.requestData method. The host then responds with either XML or JSONP based on the format you've asked for in the above arguments. After the response is handled, the script element is destroyed. k - The key the API found on AIMBuddyListContainer's wim_key attribute. c - The callback that the returned json object should be passed to. The API routes all responses through AIM.core.acceptData. How does the client know what to do? Every transaction and event type can have multiple callbacks assigned to it. Every time a presence event is received, AIM.ui.updateBuddyList is called. Additional callbacks can be pushed into the array, and each will be passed the JSON object from the host. This model makes it very easy to modify or overwrite the default behavior of the API. A script element that holds open a connection to the host, waiting for event notifications. In non-Mozilla browsers, this is a 60 second "long poll". In Mozilla, it is a two second poll. When the listener receives an event or events, it is processed, the listener is destroyed, and a new listener is created. If using the base API, it is unlikely that you'll need to create or destroy listener or transaction script elements. All of this is taken care of by the various transaction API, such as AIM.transactions.sendTextIM. You pass it the AIM id and the message, and it takes care of everything we just covered. That means you don't have to manage URL arguments or the host API URLs or any other minutia. The entry point that starts up communication between client and host. Takes a list of event subscriptions as its argument. Code 200: The user is logged in via SNS, and a token that will be used on all transactions is passed back. Code 450 or 401: Token fetch failed. A redirect URL is provided, which will be opened in an iframe. Generally the SNS sign in. Any other code: We fail over and bail out completely. The iframe is created, but how do we know that the user has authenticated? Or canceled? Or done nothing at all? Using fragment identifiers, the iframe can talk with the parent document, allowing cross domain communication. The API watches for these identifiers and takes the appropriate actions when it finds them. For example, when the user successfully completes the login process, #AUTHDONE is sent to the parent document. We can call getToken again, and this time we'll get a successful response with a token. Now we can start a session with the host. Code 200: All is well, and we'll start receiving event notifications immediately. Code 450: The user hasn't granted the application permission to take the requested action. We need to get that permission. Code 451:The user doesn't have the appropriate rights to use the application. Example: a kids account. Any other code: Alert the user that we're having technical problems and to try back later. 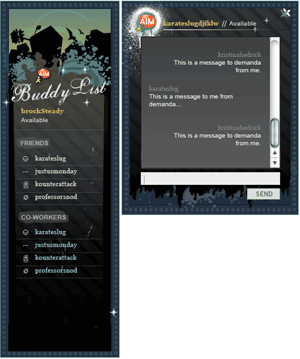 Any application requesting access to the buddy list or to send IMs must first get permission from the user to do so. The permission URL is served in the same manner as the login screen. Users may choose to "Grant Once", "Grant Always" or "Decline". We'll start getting events coming down the pipe. The first is the "buddylist" event, a massive JSON object containing the entire buddy list, complete with presence data. The API accepts this data and builds the buddy list with it. From there, events come in as they happen. Buddies signing on and off, changing states, incoming instant messages, typing status, etc. How Does the API Break Down? Provides client to host communication methods. Defines various parameters that direct how the API behaves. Provides methods for creating a buddy list, windows, and accessing parts of the UI. A series of utility methods. Methods to handle Whimsical setup. Sample Markup for theme creation.